Are you running a hotel, resort, cafe, lodge, food joint, spa, vacation/rental services and so on? And looking for a WordPress hotel themes, WordPress resort themes, or WordPress hotel booking themes that comes with a features like hotel reservation, room photo gallery, guest feedback and testimonials, Hotel video intro, hotel resort social media integration, etc you are at the right place. Here, I have collected some of the best hotel resort Premium WordPress themes which will help you out. A stylish and intuitive website is an invaluable tool for every hotel. Your hotel website should contain all the information a guest might need. Start with basic information about your rooms and rates as well as information about amenities, on-site restaurants, and more. 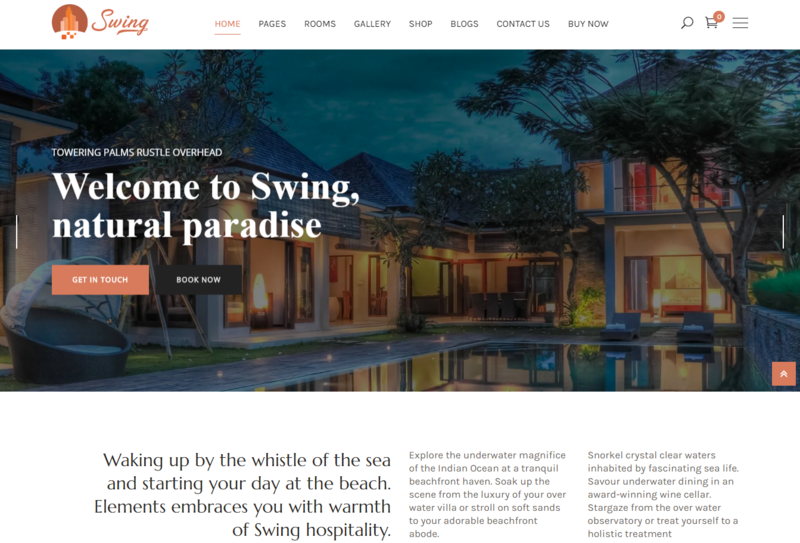 Swing is a beautiful Hotel WordPress Theme. The theme is designed to showcase your hospitality industry like hotel, suites, resort, BnB, accommodation, and rooms for rent. 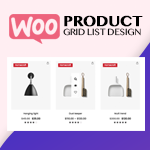 The theme is beautiful design and high coding quality. The theme is also versatile to be used with Corporate and Agency Websites. Soho Hotel Booking is a Premium Hotel WordPress Theme. The theme allows you to easily create a website which works for your hotel. The theme manage bookings, payments and guest queries with ease. The theme has beautiful and clean designs. The theme includes lots of important features. Thus, one of the best choice for creating a Hotel website. Hotel Master is a Hotel, Hostel, Apartment Booking WordPress Theme. The theme is the best hotel, hostel, resort, apartment, b&b room reservation WordPress theme. It comes with the best room booking system and allows users to browse available rooms easily. The theme is well designed for hotel, apartment, b&b(bnb) and resort website. Hotel master has created COUPON post type so you can create coupon code for your customers. 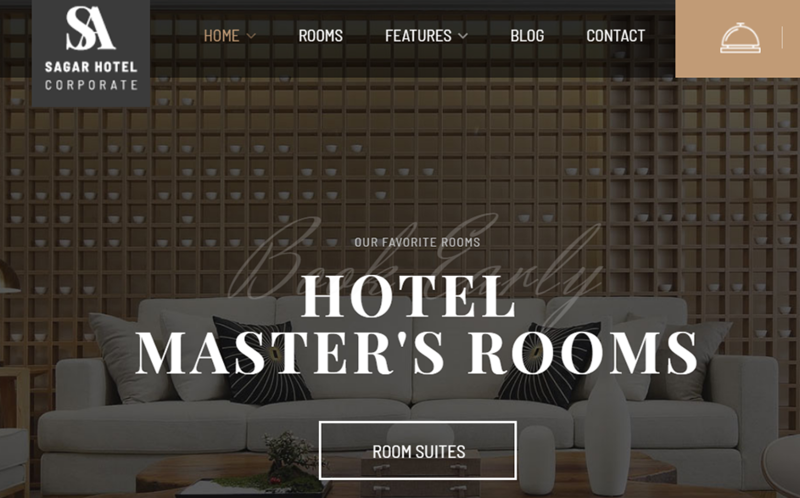 Bellevue is a beautiful premium Hotel WordPress Theme. This beautiful WordPress theme is best for Hotels, Vacation Rentals, Beach Houses, Chalets, Cabins, and Cottages. The theme includes everything you would expect from a premium WordPress theme and it will help you to build an awesome Hotel or Bed and Breakfast website. Full WooCommerce support for secure payments. Formidable and Formidable Pro Support. Nation Hotel is a Responsive WordPress Theme created by latest HTML5 and CSS3 techniques. The theme is specially designed for hotels, Motels, Guest House, Hostels and any other hospitality business. 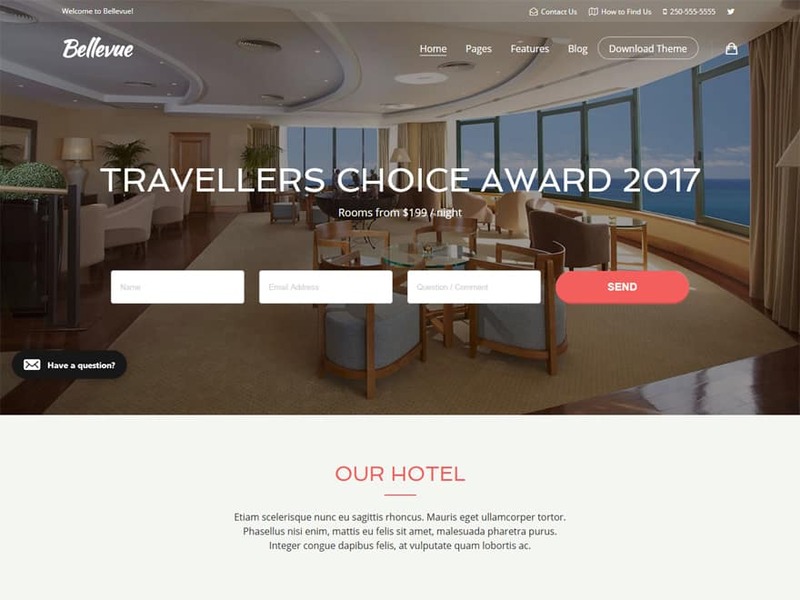 This theme includes all that you need to quickly launch fully functional Hotel related website that your customers will love. The theme support awesome WPML Multilingual Plugin so it can be easily translated to any language. 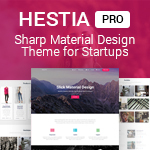 Hotec is a sleek and clean responsive WordPress theme for your spa, resort and hotel business. The theme so versatile that you can use it for everything you want (corporate website, portfolio…) This responsive theme is Compatible with IE8+, Firefox, Safari, Opera, Chrome and includes documentation. Sailing is a premium Hotel WordPress Theme. The theme is WP theme for running hotel, hostel, resort or any other accommodation services w/ an excellent online reservation system. The theme is managed by TP hotel booking, the improved version of WP Hotel booking. This beautiful them is already used by more than 1000 hotels, resorts all over the world. 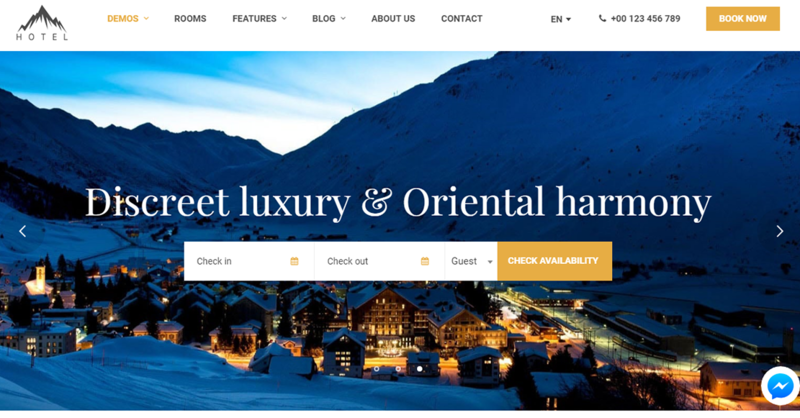 Leisure Hotel is a Premium WordPress Theme for Hotel, Resort & Spa. 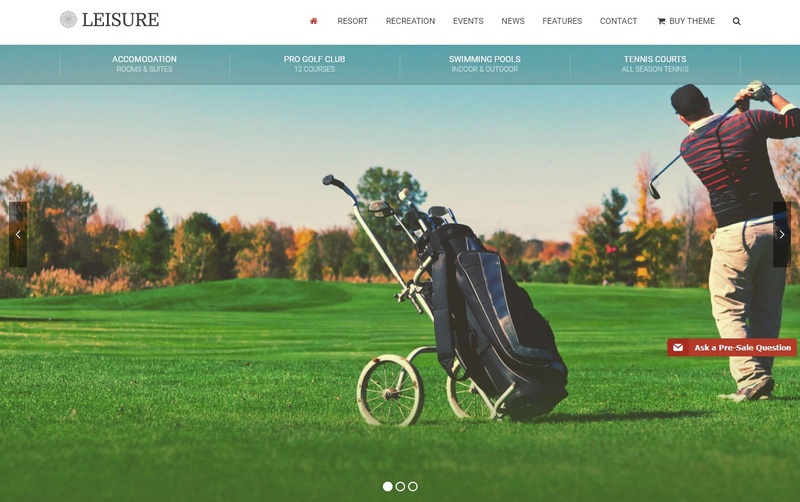 The theme is the perfect choice for any website dedicated to leisure and recreation business, like golf clubs, soccer and tennis center, leisure pools and spas, holiday resorts, hotels and other similar activities. 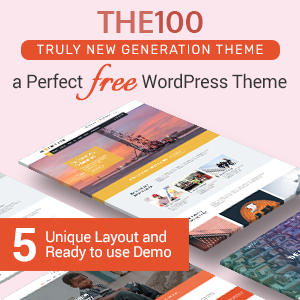 The theme is uniquely suited for eye-catching displays. 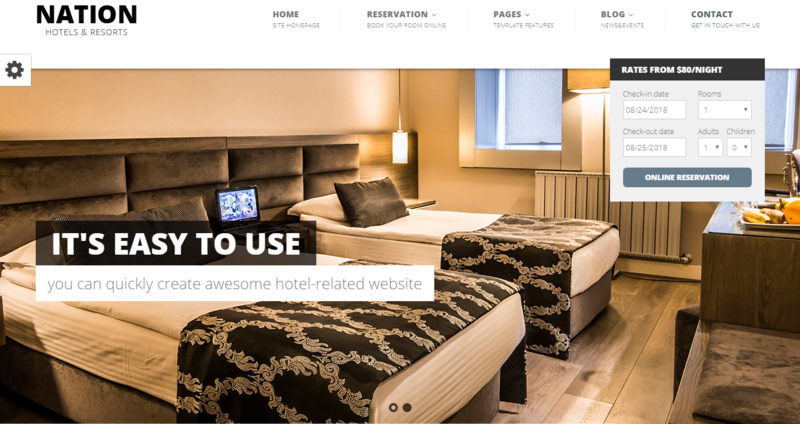 Hotel Calluna is a modern hotel, resort, motel & apartment WordPress theme. The theme includes booking & reservation form. The theme allow you to easily add rooms, events & offers to your hotel website. You can create your own professional hotel website by using the WordPress customizer. 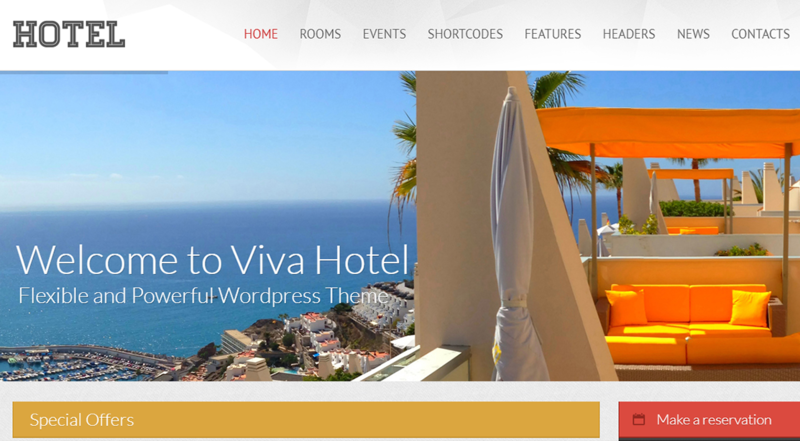 Viva Hotel is a powerful Premium WordPress Theme. The theme lets you customize a wide variety of features from the comfort of your Dashboard. 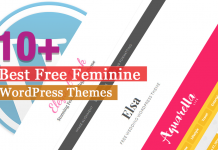 The theme has unique and beautiful design. The theme includes powerful Administration Panel, Social network links, Typography and much more. 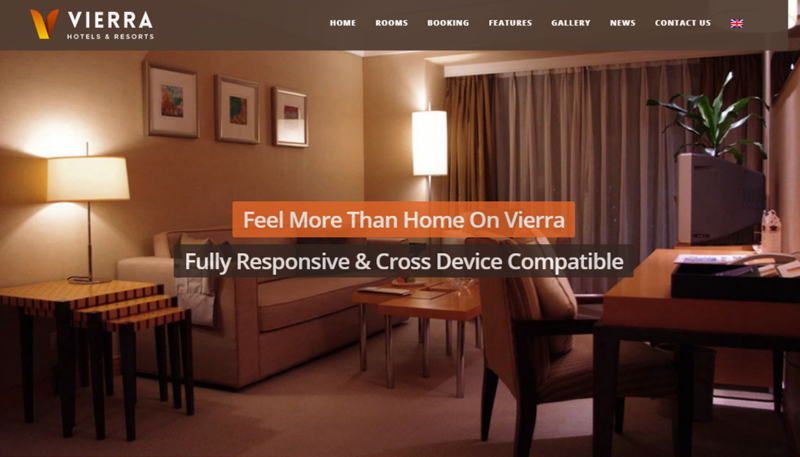 Vierra is a Premium WordPress theme for hotel. The theme help you build beautiful hotel website in no time. The theme is very easy to use even for beginner. The theme has clean & Responsive Design and is Cross device compatible. Also, the theme support multi-language and already translated to 8 languages. Hotel WP is the most charming, luxurious and powerful WP template. The theme is for Bed and Breakfasts, hotel, hostel, resort, vacation room/apartment rental services. The themes aims to help you easier manage your rooms listings, customer bookings and reservations online, pricing plans and coupons. 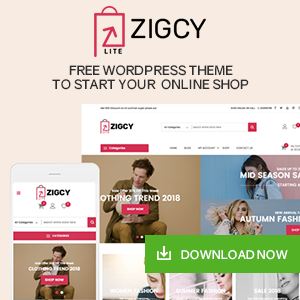 This theme can showcase your unique accommodations to the world and attract more visitors to your website with its beautiful design, and high coding quality. All these themes are the best Premium hotel and resort WordPress themes that comes with awesome features. You can easily create an awesome looking website in lesser time. 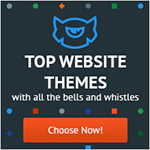 These themes are carefully selected and well tested. Have any problems with the theme then you can comment us below I’ll try to solve your problems. Or, you have already used the theme then you can share your experience with us which will be very helpful to the newbie. Previous articleHow to enhance your WordPress website Navigation with Mega Menu, Fly Menu, Circular Menu, Custom menu icons and more! 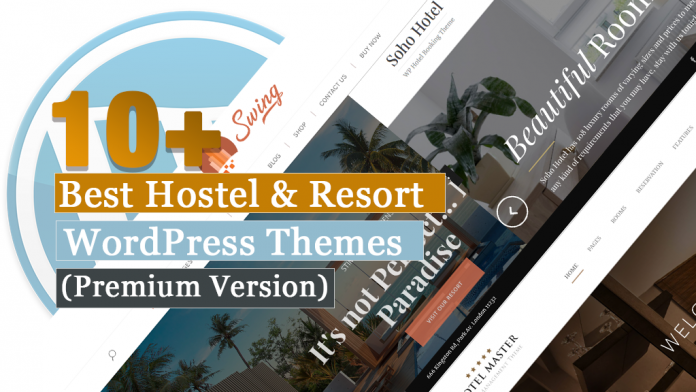 Hey Buddy!, I found this information for you: "10+ Best Hotel / Resort Premium WordPress Themes and Templates". 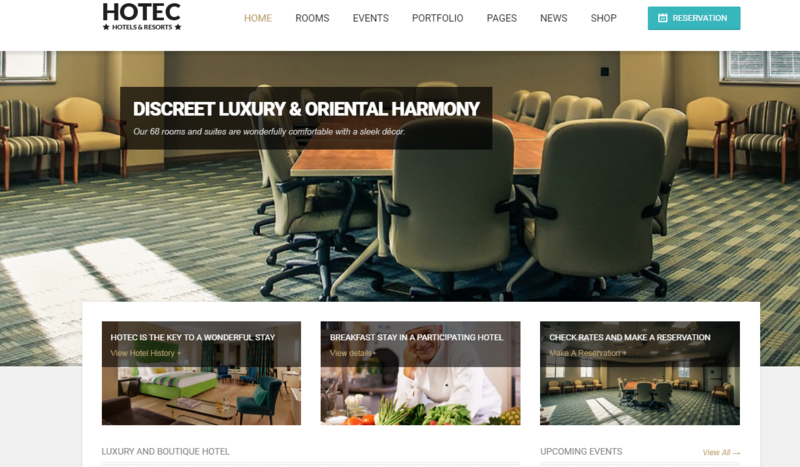 Here is the website link: https://wpallclub.com/best-hotel-resort-premium-wordpress-themes-templates/. Thank you.